The Philippines is one of the top food destinations in the world. Aside from its rich traditional cooking, Pinoys have devised ways to make food a lot tastier. By exploring various techniques and ingredients, Filipinos have made eating delicious a lot less affordable. This part of the cuisine is the cherished streetfood. Streetfood is what feed millions of Filipinos every day. It’s what people crave for and what people want. Pinoys just love making turo-turo, tusok-tusok, and takal-takal budget-friendly yet great tasting grub because we don’t just have bbq, we have isaw/sss, betamax, bato, helmets, and more! Our eggs go with anything; ham, bacon, tocino, tapa, hotdogs, and footlongs. Home cooked meals can be found everywhere and not just at home. The desire for good food is more than just soothing the rumblings in the tummy but satisfying the cravings of the palate. Through restaurant hunts and accidental discoveries, people have identified amazing food stops and dining hubs that fill the need for good food in more ways than one. From restaurants with unparalleled specialties to streetfood talked about by thousands, food has come a long way from being a mere necessity to live but something that makes living a lot more pleasurable. SM Hypermarket, along with Unilever, Nestle, San Miguel, Alaska, Del Monte, P&G, CDO, Frabelle, Farm Fresh and Bounty Fresh, brings together the best of the best in food cravings in an event that just might be a food lover’s dream come true. 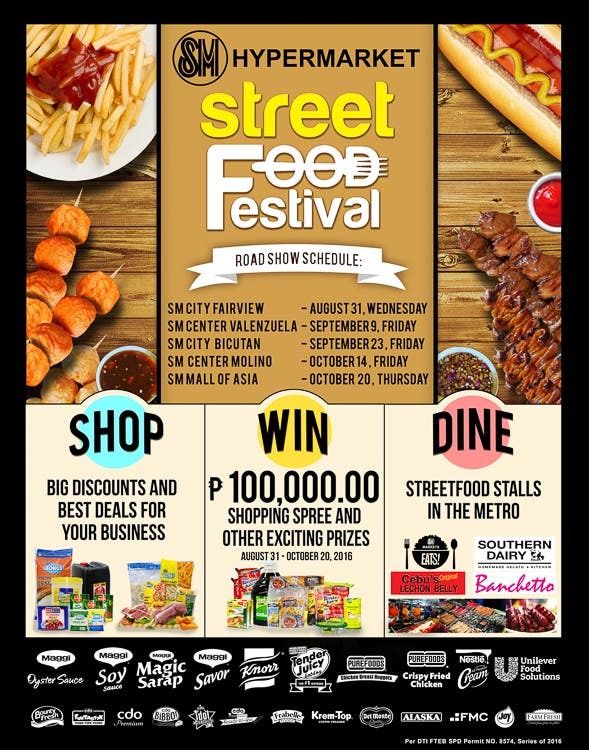 SM Hypermarket launches its annual Streetfood Festival which gathers streetfood business legends as well as incoming game-changers such as Cebu Lechon Belly, Southern Dairy, Banchetto’s Crepes, Takoyaki, and Bacon-wrapped delights, the best-selling SM Markets Turon with Langka and more. The Streetfood Festival focuses on the rich food culture of everyday Filipino food and highlights the talents of the people who make them. Aside from featuring a variety of best-selling delights, attendees are sure to learn a thing or two from cooking demos of renowned chefs. They are also in for a treat as usual grocery buys available at the event will be on irresistible promos such as price-offs and bundles. 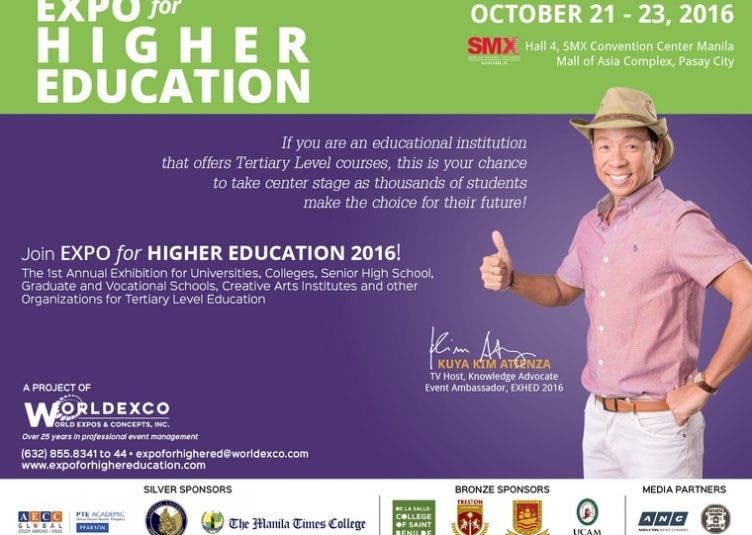 Event-goers can also take home exciting prizes by joining a ton of exciting games open to everyone. The grand launch will be held at SM Hypermarket Fairview on August 31 followed by delicious road shows at SM Valenzuela on September 9, SM Bicutan on September 23, SM Molino on October 14, and capped-off with the grand finale on October 20 at SM Mall of Asia. And to make things a bit more tasty, specially bundled packs will be available at select SM Hypermarket branches from September 1 to October 20 which will contain raffle coupons to win P100,000. So ready your appetites because it just might be the most heavenly food festival there is.